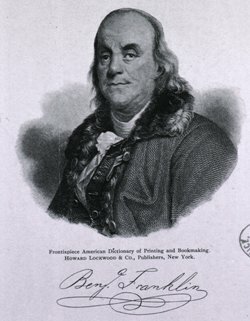 This portrait of Benjamin Franklin (1706-1790) includes a facsimile of his signature. The publication date is unknown. American statesman, author, and inventor Benjamin Franklin was a man with so many skills and disciplines he seemed to touch almost every aspect of early American life. Known for his innovations and experiments including the Franklin stove, the lightning rod, bifocals and daylight savings time, Franklin often comes to mind in June for his most famous experiment. On June 10, 1752 he flew a kite with a key attached to it during a storm to prove that lightning and electricity were the same. Sometimes overlooked in the multiplicity of his talents are Franklin’s contributions to the history of medicine. In 1751, Franklin and Thomas Bond, an American physician and surgeon, established Pennsylvania Hospital, the first hospital in what was to become the United States of America. In 1752, Franklin invented the first flexible urinary catheter—for his brother, who suffered from kidney stones. Though his device was a modification of a European catheter, Franklin’s catheter remains the first of its type created in America. Franklin’s vision deteriorated as he grew older. He was both myopic (near-sighted) and hyperopic (far-sighted). An avid reader, he grew tired of switching between two pairs of glasses—one that helped him see close up and another that improved his distance vision. In 1785, he had the lenses from his two sets of glasses cut in two horizontally and mounted back into spectacle frames, with the lens for close work at the bottom and the lens for distance at the top—the first bifocals.